Wes Westrum was a superb defensive catcher for the New York Giants in New York City’s post-World War II golden years (1946-1957), when the Yankees, Dodgers, and Giants won 17 of 24 pennants and nine of 12 World Series. Westrum was selected to the National League All-Star team in 1952 and 1953 and caught all six games of the Giants’ loss to the Yankees in the 1951 World Series and all four games of the Giants’ sweep of the Cleveland Indians in the 1954 Series. He was pictured with Milwaukee Braves slugger Eddie Mathews and umpire Augie Donatelli on the cover of the August 16, 1954, inaugural issue of Sports Illustrated. Westrum later managed the New York Mets and San Francisco Giants. It was quite a journey for the humble athlete, born Wesley Noreen Westrum on November 28, 1922, in tiny Clearbrook, Minnesota (1940 population: 425), nestled in the far northwestern part of the state, 250 miles from Minneapolis and a world away from the major leagues. Westrum starred in football, basketball, and baseball in high school. He was a bruising fullback, and many of his old friends and opponents thought football was his best sport, but he got a chance to play professional baseball while still in high school. He signed with the Crookston (Minnesota) Pirates of the Class D Northern League in 1940, while he was still a junior at Clearbrook High School. (Because of the scarcity of summer jobs at the time, schools permitted youngsters to retain their eligibility if they played summer professional baseball.) Westrum originally was slated as an understudy to catcher and manager Fred Neisler, a ten-year minor-league journeyman, but he got some extended playing time when Neisler injured a foot. Westrum lost three weeks in July when he severely cut his right wrist in the team bus – foreshadowing, perhaps, the many injuries that would later plague his career. He finished the season with a .275 batting average, 3 home runs, and 23 runs batted in. Westrum signed with the Minneapolis Millers of the American Association (then Class AA, the minors’ highest classification) after graduation in 1941, and was sent to play with Eau Claire in the Northern League, which had moved up to Class C. He had a great year, hitting .330 with 7 home runs and 70 RBIs, and was voted the league’s All-Star catcher. Westrum went to spring training with the Millers in 1942 but was optioned to Little Rock of the Class A1 Southern Association. An injury and some weak hitting limited him to 45 games that season. He sat on the bench behind ten-year minor-league catcher Herb Bremer, who had played 70 games with the St. Louis Cardinals from 1937 through 1939. Westrum finished with a .202 batting average in 104 at-bats. Nevertheless, the Millers, who were considering switching Westrum to the outfield, brought him back to their spring-training camp in 1943. But like most young players at the time, Westrum was drafted and was in the Army for the next three years. He spent most of his time working security at the Green Haven Army Barracks, near Poughkeepsie, New York. Green Haven was a maximum-security state prison used by the Army to house deserters and other military miscreants. In later years Westrum joked that the experience was valuable in helping him deal with the hapless New York Mets when he managed them in the mid-1960s. It was, he said, “a place for difficult cases. … It was good training for the Mets.”1 He met his future wife, Josephine, in Poughkeepsie as well, and they made the city their year-round home after their marriage. Westrum worked as a youth coach at the Poughkeepsie YMCA, played some semipro basketball in the offseasons, and eventually became a deputy sheriff in Dutchess County. Westrum said he was also working hard at protecting his right hand. By his own count, he suffered eight broken fingers in his 11 seasons in the major leagues. In addition, he was plagued constantly by sprained or jammed fingers. Westrum said he might have done better at Jacksonville but that an early-season jammed finger slowed him the rest of the year. Catching gloves of the 1940s and 1950s demanded a two-handed catching style, with the right hand (only five left-handers have caught more than 100 games in major-league history) used to trap the ball in the pocket. Catchers waited for the pitch with their bare hand clenched in a fist next to the glove, and opened the hand at the last possible instant to trap the ball or to grab it to prepare to throw out a potential basestealer. In theory, the hand would still be in a fist when a foul tip was struck, but frequently the catcher would be opening his fist at the same time, exposing his fingers to possible injury. Flex-hinged designs that began to resemble first basemen’s gloves didn’t come along until the late 1960s, when today’s one-handed catching style was pioneered by the Cubs’ Randy Hundley and Cincinnati Hall of Famer Johnny Bench. Some old-time catchers were better or luckier at avoiding right-hand injuries, but bent and gnarled fingers were definitely an occupational hazard. It was easy to pick out a retired catcher in a room full of retired players by observing his hands. Westrum had a breakout season with the Millers in 1947, hitting .294 with 22 home runs and 87 RBIs. He was the top vote-getter at catcher in the All-Star voting. (The American Association did not play an All-Star game, however.) The Giants called Westrum up in September, but he played little as five-time All-Star Walker Cooper was chasing Gabby Hartnett’s record 37 home runs in a season by a catcher. (He fell short with 35.) However, Westrum did get five hits in 12 at-bats and was virtually given the job as Cooper’s backup in 1948. Giants farm director Carl Hubbell drooled when he talked about Westrum. The team was convinced that Westrum was the best young catcher to come into the league in years. The 1948 season, unfortunately, turned out as disappointing as 1947 was promising. Westrum did win the number 2 catching spot in spring training, beating out 33-year-old journeyman Mickey Livingston, who’d played 467 games in the majors over seven seasons, and 24-year-old prospect Sal Yvars, another September call-up in 1947. Westrum got a big opportunity when Cooper had knee surgery in early May, but he hit only .127 in his first 34 games of the season, and lost playing time to Livingston, who at least kept his batting average over .200. Cooper wound up catching in 79 games, Westrum 63, and Livingston 42. For the season, Westrum hit only .160 in 125 at-bats. Bob Mayer related a similar story in his November 2001 Baseball Digest article, “Turn Back the Clock: Former Catcher Wes Westrum Recalls Career With Giants – Interview.” However, in this version of the story, the events took place after Westrum’s late September call-up in 1947, in the second game of a doubleheader at Chicago when the Giants’ manager was Mel Ott. The facts are that Westrum did catch his first major-league game on September 17, 1947, in Chicago. He went 2-for-4 in the Giants’ 12-10 loss, but Jansen did not pitch in the game. On the other hand, Westrum caught Jansen’s 2-0 win over Cincinnati on June 14, 1949. It’s possible that Westrum just got his facts confused in the Mayer interview. It’s also possible that the episode never happened – another of baseball’s apocryphal tales that acquire the status of truth from their continued telling. What is clear, however, is that players and fans who knew Westrum could easily believe the story was true because he played so often with injured and broken fingers. Westrum split catching duties with Ray Mueller for the balance of the 1949 season. After a slow start, his hitting picked up in the last two months of the season, and he finished with a .243 batting average and showed some power, with seven home runs in 169 at-bats. Westrum became the regular catcher in 1950 and had a banner year. He caught 139 games and set a National League record for catchers with only one error in 680 chances, a .999 fielding percentage. Buddy Rosar held the American League record, set in 1946 when he caught 117 games for the Philadelphia Athletics with no errors. (Four regular National League catchers have had errorless seasons since 1950 – Charles Johnson, 1997 Florida Marlins; Mike Matheny, 2003 St. Louis Cardinals; Chris Iannetta, 2008 Colorado Rockies; and Chris Snyder, 2008 Arizona Diamondbacks.) Westrum was hitting about .270 until injuries brought him down to .236, but he hit 23 home runs – second on the team to Bobby Thomson’s 25 – and drove in 71 runs with just 103 hits. Despite his low batting average, he drew 92 walks, fourth in the league, and had a .371 on-base percentage. He had his career day in a game against Cincinnati on June 24 in the Polo Grounds in New York, when he went 4-for-4 with three home runs and a triple, and scored five runs in the Giants’ 12-2 romp. Westrum lost some time early in the 1951 season due to a broken fingertip caused by a foul tip, and both hands were beaten up most of the season, but he caught 122 games and was a key player in the Giants’ miracle pennant drive. The team was 13 games behind the Dodgers on August 12, which was observed as Wes Westrum Day at the Polo Grounds, sponsored by Dutchess County. Westrum often joked that the pennant drive began when he was given a car by his hometown fans and friends – as the Giants won the game to begin a 14-game winning streak that cut the Dodgers’ margin to five games. (How times had changed – when his Clearbrook friends sponsored a “day” for the young catcher at Crookston back in 1940, his gift was a pen-and-pencil set.) The Giants wound up tied with the Dodgers, and their fairy-tale season was climaxed by Bobby Thomson’s three-run homer in the bottom of the ninth for a 5-4 win of the third and final playoff game. After that the World Series seemed like an anticlimax, and the Giants lost to the Yankees in six games. But Westrum couldn’t keep his hands in shape. His 1952 season got off well. He played in 54 of the Giants’ first 55 games, with 12 home runs and 29 RBIs. Then he broke another finger, re-injured it when he returned to action, broke a thumb, and then suffered a split finger. He managed only two home runs and 14 RBIs in his last 60 games and wound up with a .220 batting average. He caught only 112 games. Westrum retained his starting position the next two years, but his injuries had taken their toll, and he was pressed by Ray Noble, Sam Calderone, and Sal Yvars in 1953 and Ray Katt and Ebba St. Claire in 1954. 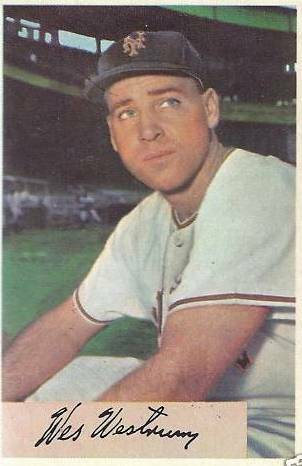 Westrum caught all four games in the Giants’ sweep of the Cleveland Indians in the 1954 World Series although he’d only hit .187 in 98 games during the season. He was backup to Katt in 1955, Bill Sarni in 1956, and Valmy Thomas in 1957. When the Giants moved to San Francisco in 1958, manager Bill Rigney, who’d taken over for Leo Durocher in 1956, told Westrum he would keep him as the third-string catcher if he still wanted to play but preferred to have him as a coach. Westrum thought it over for a few days and decided to retire and accept the coaching position. His career line, with 11 seasons in the majors, showed him with 919 games played, 302 runs, 503 hits, 96 home runs, and 315 RBIs. He had a batting average of .217 and an on-base percentage of .356. Westrum started as the pitching coach at San Francisco in 1958 but was made the first-base coach in 1959. As a catcher he had been respected for his astute baseball sense and field generalship. He claimed he could often tell when a baserunner was going to attempt a steal by the way he took his lead from the base. As a first-base coach he quickly acquired the reputation as a great pitch-stealer. He said that many pitchers unknowingly telegraphed their pitches by the way they gripped the ball or stood on the rubber. Even if they tried to hide their grip, some tilted their glove or wrist a little differently from one pitch to another. There wasn’t much time to relay the pitch information to a batter. Westrum would use voice signals for left-handed hitters, who could not see him in the first-base coaching box. For right-handers he might use his posture as a cue – bending over for a curve, for example, or standing straight up for a fastball. Of course, there would have to be an indicator to tell the hitter when he actually knew what pitch was coming. Westrum and his family moved to the Phoenix, Arizona, area during his Giants coaching days, and he worked for the Arizona State Highway Department in the offseason. After the 1963 season, he was involved in a rare coaching trade of sorts. Mets coach Cookie Lavagetto, who had just recovered from a serious illness, asked if he could be moved to San Francisco to get back to his hometown in Oakland. After some discussions with the owners and managers of the two teams, the Giants agreed to take Lavagetto as a coach to replace Westrum, who was made a coach with the Mets for manager Casey Stengel. In July 1965 the 75-year-old Stengel fell and broke his left hip while stepping out of a car. Major surgery was required, and Stengel pulled a surprise when he called Mets president George Weiss and recommended Westrum as the interim manager. Most thought that his choice would be coach Yogi Berra, whom Stengel had once called his “assistant manager” when Berra played for Stengel with the New York Yankees. Picking Westrum, though, seemed to indicate that Stengel planned to return as manager in 1966, figuring it would be easier for Westrum to step down than for the popular and ambitious Berra. Five weeks later, however, Stengel announced his retirement. Westrum, in the meantime, promised to telephone Stengel regularly for advice and tried to get the team to focus more on baseball. “I want the players to talk more baseball, particularly in the clubhouse. … Every time we lose, I want them to spend five minutes in front of their locker trying to find out what they did wrong,” Westrum said.7 If the players followed through, it didn’t show on the field. The team that had won 40, 51, and 53 games in Stengel’s first three years finished 19-48 under Westrum for a 50-112 overall record and the team’s fourth consecutive last-place finish. Westrum was the fourth of five players on Leo Durocher’s remarkable 1951 Giants team to become a major-league manager. Eddie Stanky (1952), Bill Rigney (1956), Alvin Dark (1961), and Whitey Lockman (1972) were the others. Coach Herman Franks later became a manager with the San Francisco Giants and Chicago Cubs, while pitching coach Fred Fitzsimmons had managed the Philadelphia Phillies from 1943 to 1945. As the season drew to a close, Westrum was looking for assurance that he would be rehired for 1968. Mets president Bing Devine, hired from the Cardinals in 1966 to succeed George Weiss, would not make a commitment, however, and on September 21 Westrum resigned, tired of losing and tired of waiting for a decision. His old friend, San Francisco Giants owner Horace Stoneham, hired him shortly to be the team’s first-base coach. Westrum remained a coach for four years, and then became the Giants’ major-league scout in 1972. The Giants tapped him to replace manager Charlie Fox on June 28, 1974. The Giants had won the National League West Division under Fox in 1971 but lost to Pittsburgh in the National League Championship Series, then finished fifth in the division in 1972 and third in 1973, and were eight games under .500 at midseason in 1974. Fox, who had been in the Giants organization as a player, coach, and manager for 33 years, “resigned in the best interest of the club.”11 The managerial change didn’t change things on the field. The team went 38-48 under Westrum and finished in fifth place in the West Division. These were tough times for Giants owner Stoneham, who was struggling financially. Rumors circulated that the team was for sale or was being relocated. Although players and team employees were being paid, the team cut costs in many areas. Despite all the off-field distractions, Westrum guided the team to third place in the West in 1975, finishing with an 80-81 record. Anticipating a sale of the team, Stoneham asked Westrum and his coaching staff to submit their resignations just before the end of the season. They refused, fearing a voluntary resignation would make them ineligible for unemployment insurance. Just before the Thanksgiving holiday, Westrum and his staff were finally fired, and shortly thereafter Stoneham sold the team to a minority stockholder, Bob Lurie, a local real-estate developer. His old friends had set up the Wes Westrum Baseball Museum in a 25-by-50-foot room in the local Clearbrook American Legion Post 256 in 1990, consisting mainly of items removed from Westrum’s lake cottage. “You don’t want to take all this junk to town,” Westrum marveled at the time.13 He hadn’t looked at some of the items for years. Some were just stored in old boxes. The museum was a great source of pride for the community, but dwindling membership forced the Legion post to sell the building, and the space for the exhibits was no longer available. It was a bittersweet day in April 2007 when most of the friends who’d set up the displays in 1990 got back together, this time to carefully take them down to pack and ship to Westrum’s daughter and family in Arizona. An updated version of this biography appeared in "The Team That Time Won't Forget: The 1951 New York Giants" (SABR, 2015), edited by Bill Nowlin and C. Paul Rogers III. It originally appeared in "Minnesotans in Baseball" (Nodin Press, 2009), edited by Stew Thornley. 1 “A Positive Thinker: Wesley Noreen Westrum,” New York Times, April 11, 1966, 49. 3 Steve Bitker, The Original San Francisco Giants: The Giants of ’58 (Champaign, Illinois: Sports Publishing, 2001), 242. 4 Arch Murray, “Even With Sore Mitts, Westrum Gave Giants Big Helping Hand,” The Sporting News, January 9, 1952, 6. 6 Barney Kremenko, “Mets’ Chris Wins Joust With Old Jinx,” The Sporting News, March 27, 1965, 7. 7 Barney Kremenko, “ ‘Profit by Your Mistakes,’ Wes Tells Mets Kids,” The Sporting News, August 7, 1965, 7. 8 Jack Lang and Peter Simon, The New York Mets: Twenty-Five Years of Baseball Magic (New York: Henry Holt and Company, 1986), 57. 10 Peter Golenbock, Amazin’: The Miraculous History of New York’s Most Beloved Baseball Team (New York: St. Martin’s Press, 2002), 191-192. 11 “Skipper Fox Resigns – Westrum Takes Helm,” The Sporting News, July 13, 1974, 16. 12 Greg Devillers, “Good Catch – Clearbrook Native and Baseball Legend Wes Westrum Dies at 79,” Grand Forks (North Dakota) Herald, May 29, 2002, C-1. 13 Mike Brue, “An Opening Day Closure – Wes Westrum’s Collection Heads to Arizona,” Grand Forks (North Dakota) Herald, April 2, 2007, A-1.